In ancient times, olive oil was considered not only as food but much more valuable. It was also used to produce both medicines and cosmetics. Hippocrates called it “the great healer” while Homer called it “liquid gold.” The ancient Greeks thought that the olive tree was created by the goddess Athena and was therefore a special treasure. Nowadays, olive oil is still called liquid gold. The well-known Mediterranean diet is based on this food. 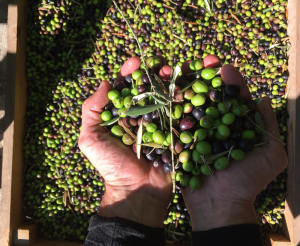 For Italians, olive oil “quello buono” that is to say the good one is produced by the farmers, and not the one industrial produced is considered the key of being healthy. My grandparents were all farmers and I still remember their attitude and dedication toward this precious golden liquid. They kept it in terracotta jars in their cellar, far from the sunlight and at the perfect temperature in order to keep it intact and undamaged. They used olive oil not only to dress the food but also as a medicine thanks to its extensive health benefits. 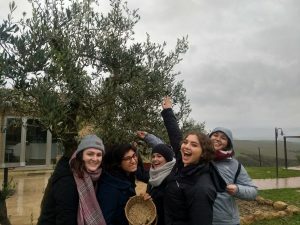 Fall 2018 SAI students picking olives! My parents still keep the same tradition alive and care for the cultivation and processing to obtain a good olive oil. 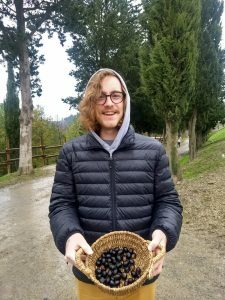 Every year at the beginning of November, we manually harvest our olive trees as they did in the past, following the same “rules” of my grandparents and showing the same care and respect for this beautiful and amazing tree. 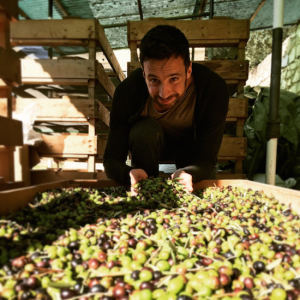 As soon as they are harvested, the olives should be pressed as soon as possible to avoid oxidation. This process has to be gentle otherwise it will be bad for the flavor. The cold-pressed process is the best way to keep all the olive’s nutrients, flavor and the vibrant greenish color and the spicy smell. Once it has been pressed, the oil is ready to be tasted for quality. 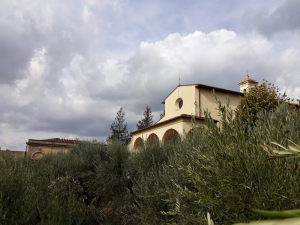 The hills surrounding Florence are full of olive groves ! The olive tasting is something that you need to experience at least once in your life. During the fall semester, SAI Florence promotes this amazing experience. Would you be interested in trying it?